Are you addicted to the pump? Do you love that skin splitting feeling that just puts you in the zone?!! The weight room is the battle field and you're going to war against the weights. Every soldier needs an arsenal of supplements to keep him war ready! Experience insane muscle pumps and energy throughout your entire workout and watch how easy it is to conquer the weight room with Noxygen by Purus Labs! Purus Labs has designed Noxygen as an unflavored preworkout/intraworkout featuring Nitratrine and Glycerine, and it can be used as a standalone pre workout or an addition to any pre workout or creatine supplement. Make sure you are fully equipped for war because there can only be one suvivor. You or the weights, you choose. Get Noxygen by Purus Labs today and dominate the battle field! What are the Benefits of Noxygen? This advanced nitric oxide formula works by creating oxygen-sparing environment through enhancing vasodilation and blood flow with Nitratene, while simultaneously volumizing muscle cells and increasing body mass with HydroMax water-soluble Glycerine. How do you take Noxygen? Add one to two scoops of Noxygen to your favorite beverage or to your pre-workout supplement 15-30 minutes before workouts, for endurance mix with your intraworkout supplement and drink throughout your training session. Yes! 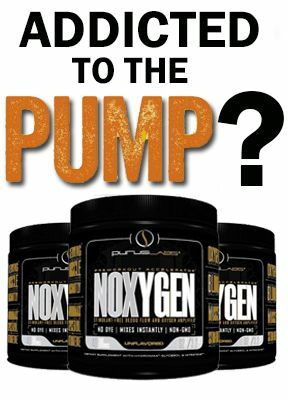 Noxygen can be stacked with with Amino D and Condense by Purus Labs.